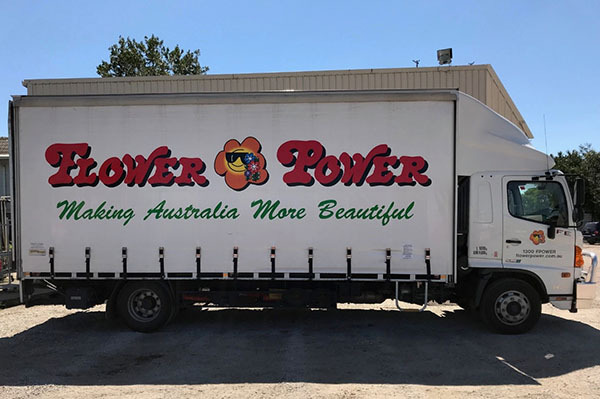 Whether you’re buying a few pots and plants, or a heavy load of soil and mulch, we’ve got a Flower Power truck to help you get it home. 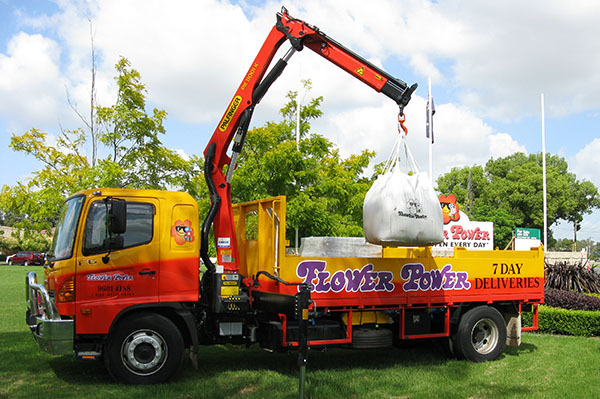 So if you’re getting stuck into a new flower bed, or completely overhauling the lawn, take a look at our delivery options below, and remember that when it comes to a Flower Power garden makeover – the sky’s the limit! 1.8m high, 1.3m wide, 3.5m long. Perfect for small deliveries to metro areas, the delivery van transports pots, bags, homewares and even small batches of turf. Fits most car spaces. Maximum clearance: 2.2m width / 3.5m height. The brand new 'tiny tipper' has a tipping capacity of up to 3.5 tonne, and a two-bay splitter that allows for delivery of multiple products. An insulated and ventilated plant compartment is also ideal for transporting plants and pots. Maximum clearance: 2.5m width / 4m height. The nifty 2-Bay tipper is designed for medium-sized deliveries of bulk materials, transporting up to 2 tonnes of loose materials like pebbles or road base, and up to eight scoops of mulch, or six scoops of soil. Ideal for narrow driveways, and low-height clearances. Maximum clearance: 3m width / 5.4m height. If you have multiple products that need to be separated during delivery, our fleet of 5 tonne tippers (2-bay and 3-bay) can keep products safely contained within individual travel boxes. 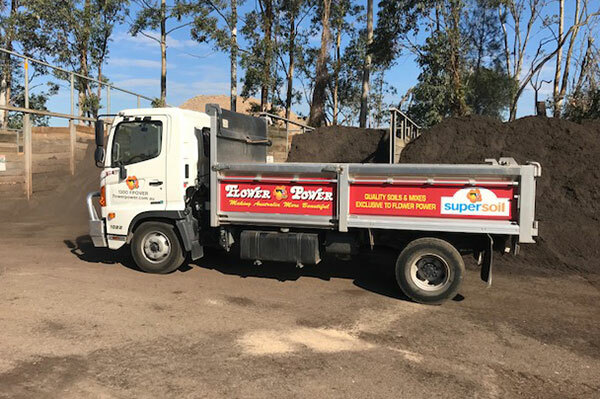 Thanks to its generous capacity, this truck transports up to 5 tonnes of loose materials, 14 scoops of mulch, or ten scoops of soils and mixes. 4.1m high, 2.5m wide, 12m long. 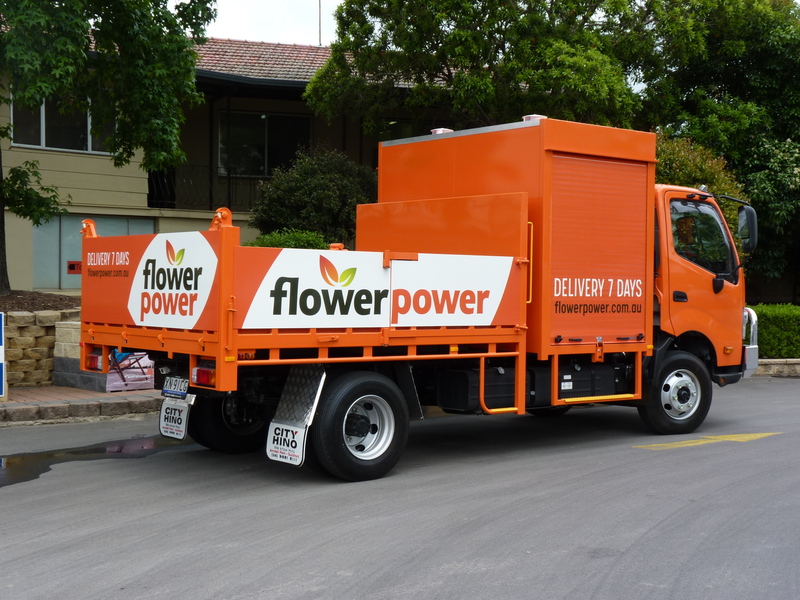 Flower Power’s brand new tautliner with forklift is a streamlined option for bulk grass, paver deliveries and all palletised products. An additional forklift allows extensive access to most homes and businesses, and direct placement of goods right to your door. 4m high, 2.4m wide, 7.4m long. 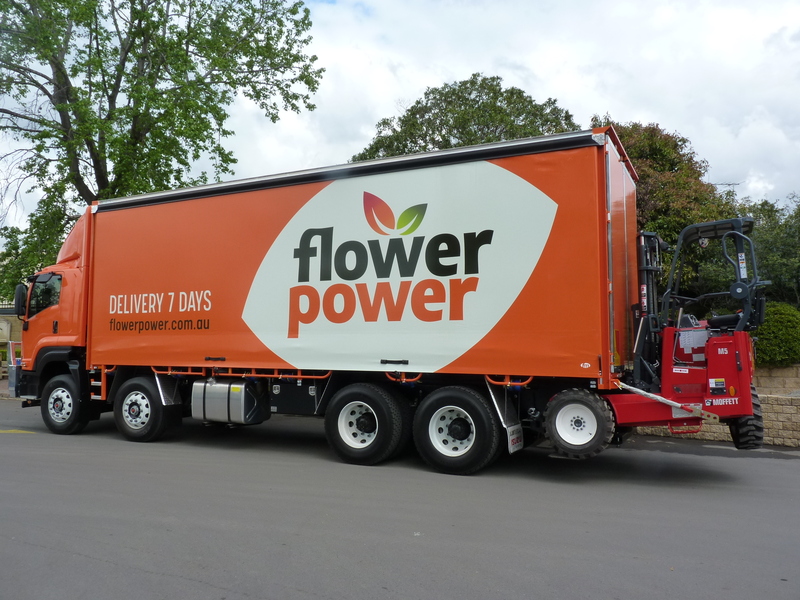 When it comes to delivering furniture and large plants, our ten pallet tautliner is sized perfectly for straight-forward two-man deliveries. Complete side cover also ensures goods are protected from the weather. 2.4m wide. Crane extends up to 3.5m high and 3.5m wide. Live in a first-floor apartment? Want your soil or mulch placed in a specific location? Our Crane Truck is designed to lift and place goods into confined spaces, and is a clean and tidy delivery option for our popular one-tonne Bulka Bags. 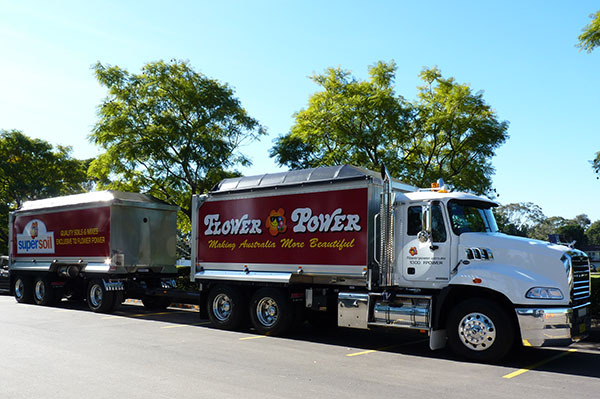 Flower Power’s Truck and Dog Tipper delivers large quantities of bulk material, direct from the pit or quarry, straight to your job site. Deliveries include bulk soils, mixes, sands and aggregates – either in a full 32m load, or a split load of 12m (truck) or 20m (trailer). 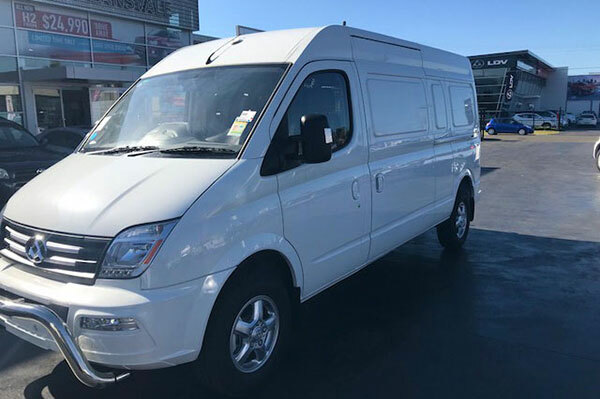 Perfect for big locations, parks and event sites. 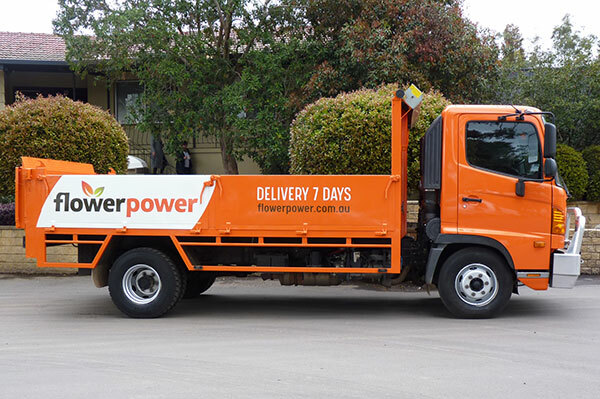 For more details on Flower Power's home delivery service, or to book a delivery, contact your nearest Flower Power garden centre.